That raccoon is unbelievably cute! Great work in a not so usual subject!! Thanks guys. The raccoon was very difficult to paint. Their fur is all wispy in a blend of browns, tans, and black—hard to convey on a painted model. Yeah, fun game scenarios could be worked out with a skunk. But, I think he'll just look cute in the background of a diorama. Always nice to see something other than blokes trying to bump each other off.Very well painted as always. Thanks west1871. Yes, I appreciate the life-affirming quality of non-combat models (and they can also be used as objectives in raid hunting or raid scenarios). 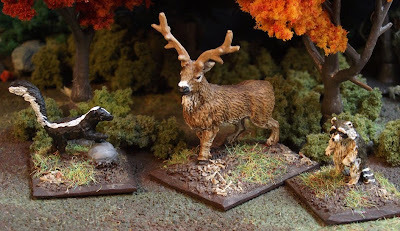 I love animals for wargaming. Really nice work! Nice work. I though Mega Minis was closer to 20mm? How do they compare to scale 1:72? Mega Miniatures' models are mostly 25mm size. 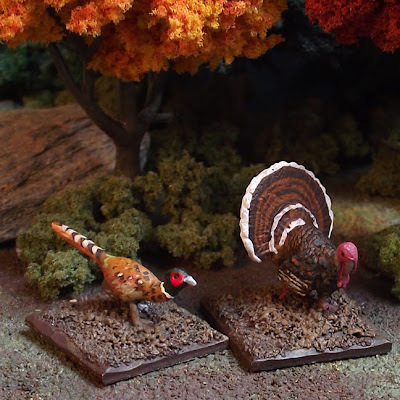 Some of the animals are a bit small and might work with 20mm. For instance their bear or wolves could be large animals in 1/72. But, for the most part their models are 25/28mm.